I really have looked around in wiki and everything but have to give up. How is the basic concept of LC regarding paper size, units and scale? Say I want draw a small building which in the end is measured 2m by 1.1m. I only have A4 paper so I will scale it down to 1:10. When printing I don't want to "scale to fit" but print precisely so I can use a ruler on it. When putting measure lines on I want LC to automatically write "2000" which indicate mm and it is written in the corner. But then comes the strange thing: When writing the title block in the lower right corner my text height has to 50mm. And the text for measured lines has to be 25mm in height. Is that the way to do it or do I fundamentally misunderstood something? And how to deal with drawings of molecules in nano meter and orbiting stars in light year when printed on A4? Draw in real size (2000 by 1100 mm). 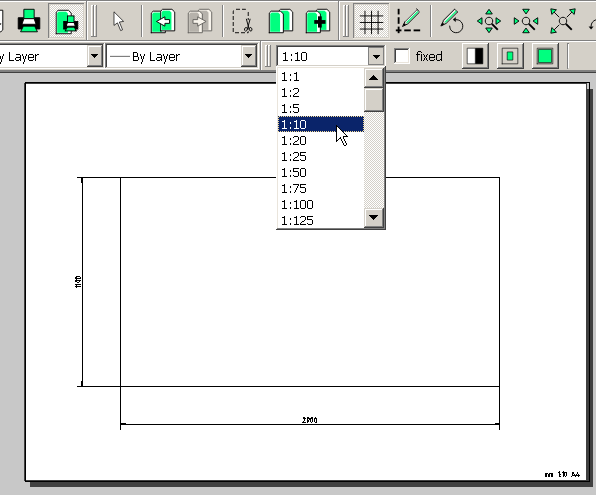 In drawing preferences - dimensions you can set General scale to 10. This automatically enlarges the dimension elements (text, arrows etc) ten times. This does not apply to normal text, so you have to size this up manually. In the printing process (Print preview!) you set the intended scale (1:10). So it's sized down again. Print from there. Thanks, exactly what I want. I got the idea but don't have that drop down scaling box on your screen shot. So if I want to draw a 2000 by 1100 micro meter square I just change the text "mm" to "µm" and the text scale from "1:10" to "100:1" and the rest is the same - still A4. In the opposite way around if I want to draw an inter galactic football field measured in light year. "that drop down scaling box" only appears in Print Preview mode.